Good Folk From Way Back Yonder. 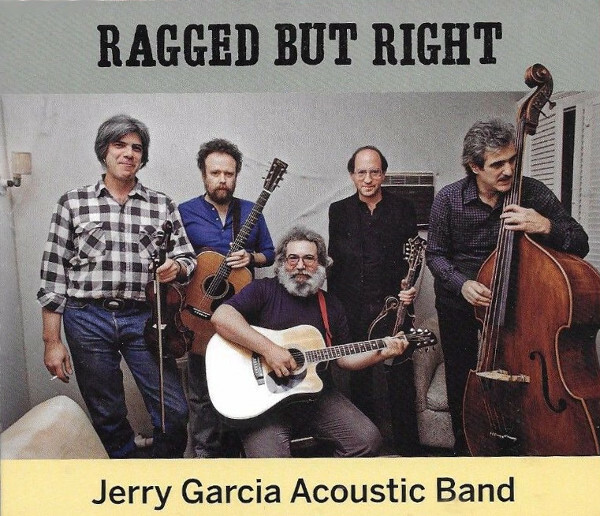 Culled from the same shows that gave us Almost Acoustic twenty years earlier, Ragged But Right is another stand-up citizen in Jerry Garcia’s musical mythology. Truth be told, the electric versions of the Jerry Garcia Band were hit or miss; sometimes they sounded great, but many times the music seemed rushed and Jerry’s voice harsh. The acoustic adventures are a different matter: relaxed, organic, uncontrived and bittersweet. I’m not naturally drawn to country music, but I’m beguiled by American folk music. Like jazz, folk music is a live conversation, only not so agitated. Jazz can often feel like everyone is talking at the same time; in folk music, there’s an equal measure of talking and listening. The band’s love for the form shines through on this selection of performances, drawn from their late 1987 appearances in New York, Los Angeles and San Francisco. Where Jerry was a cog in the wheel of Old And In The Way, he’s the anchor of the Acoustic Band, handling most of the lead vocals and lead guitar with charm and aplomb. The rest of the band is solid in a supporting role, with Sandy Rothman and David Nelson contributing harmonies and delivering an impressive a capella version of “Bright Morning Star.” From the pickin’ & singin’ side, highlights include “Trouble In Mind,” “Deep Elem Blues” and “Goodnight Irene.” Unlike the earlier Almost Acoustic, Ragged But Right has a raw feel, as though you’re sitting right there in the audience. The sonic fidelity is just fine, but the banter from Jerry and the hoots and hollers from the audience enhance the experience. Listening to good folk music is like going to church: It makes you feel good about an imperfect world. Until we reach that perfect world, this’ll have to do. Jerry Garcia (guitar, vocals), John Kahn (string bass), David Kemper (snare drum), Kenny Kosek (fiddle), David Nelson (guitar, vocals), Sandy Rothman (mandolin, dobro, banjo, vocals). Produced by Sandy Rothman; live recording for John Cutler; digital editing by Brendan Doyle and Joe Gastwirt; executive producer: Peter McQuaid. Package photographs by Ken Friedman. Essay by Steve Silberman. Essay images courtesy of Sandy Rothman. Recorded live in October and December 1987 and released on compact disc in 2010 in the US (Jerry Garcia Family, JGCD-1003).